FEIN MultiMaster E-Cut Long-Life blade - 65mm wide. 300% longer service life! 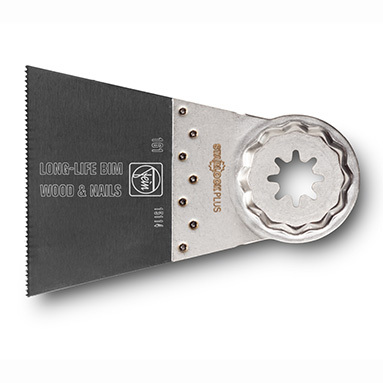 (compared with the E-cut standard blade). Bi-metal teeth protect against nails in wood and masonry. For all wood materials, plasterboard, plastics and fibreglass reinforced plastics. No smoke when sawing, even after long use. Developed and manufactured by FEIN - made in Germany. Supplied individually (not in blister packs).